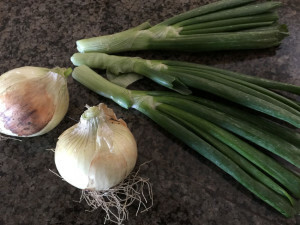 Texas Sweet Onions are available mid-April through June. Fat-free, very low in Sodium, a great source of fiber, high in vitamin C, & cholesterol-free. Good-quality sweet onions will be firm, free of blemishes or mold spots and have even-colored, light-yellow skin. Peel away outer skin of onion and slice. Delicious raw in salads, barbecued on shish kebabs, in stews and soups, on sandwiches and in meat dishes.